Published on May 11, 2011 by Wade Shepard Follow me on Twitter here. There are over eight official land border crossings between Mexico and Guatemala. This page attempts to explain the main traveler routes in detail. Note: If you have crossed at a border that is not published on this page, please contribute your information. This page cannot be complete without contributions from other travelers. 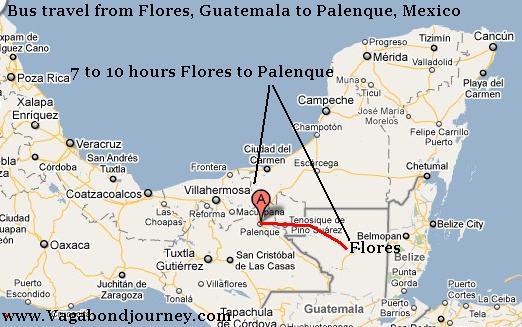 Between Palenque and Flores is a major route for travelers crossing the border between Mexico and Guatemala. 1. Take a bus to the border, cross the river by boat, and then get on another bus on the other side. To travel to the border and cross yourself, you need to go to the border towns of either Bethel/ La Technica or Frontera Corozal depending on what country you are exiting from, and then take a boat across the Rio Usamacinta. You can then find transport on the other side to go to Palenque, Flores, or wherever else you would like to travel to. 2. Take the tourist shuttle, which will take care of the river crossing and provide transport on both sides of the border all the way between Palenque and Flores. This method takes around seven to ten hours. The tourist shuttle costs 30+ USD while the independent transport method can be done for around 20 USD. It has been reported that the Mexican authorities are more willing to provide tourists with 180 day visas if they are with a tour group. Sometimes, if traveling independently, they are more prone to only giving you 90 days. This is a hearsay report, but may come in handy if you are debating which option to choose. More Mexico/ Guatemala border crossing information to be added soon.